ReadWorks is a non-profit service that offers hundreds of lesson plans and thousands of non-fiction and fiction passages aligned to Common Core standards. Additionally, each article is listed with a Lexile score and suggested grade level. 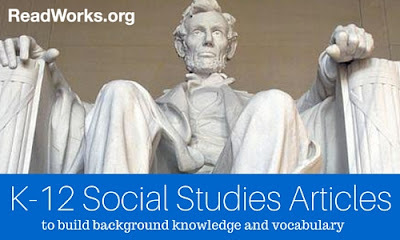 The latest batch of articles added to ReadWorks covers topics in social studies. The articles and lesson plans for K-5 primarily deal with topics in U.S. History and civics. Articles for grade six through twelve have a mix of U.S. and World History topics. Each article in the collection is accompanied by a set of reading comprehension questions. Those questions are a mix of multiple choice and open-ended questions that you can use for group discussion or individual reflection. One of the aspects of ReadWorks that I like is that lexile scores are listed for each article along with grade levels and Common Core standards. So if Common Core standards are not relevant to your situation, ReadWorks still makes it easy to find fiction and non-fiction articles that are appropriate for your students. With a free ReadWorks account you can search for lessons and reading passages by grade level, lexile score, reading skill, subject area, and text type (fiction or non-fiction). In your ReadWorks account you can create digital binders of the lesson plans and reading passages that you want to use.